The record growth of Antarctic sea ice has long been a troubling contradiction for global warming theory. But those who embrace CO2 as the driver of climate change typically countered that global warming was still melting the continental glaciers and raising sea levels. 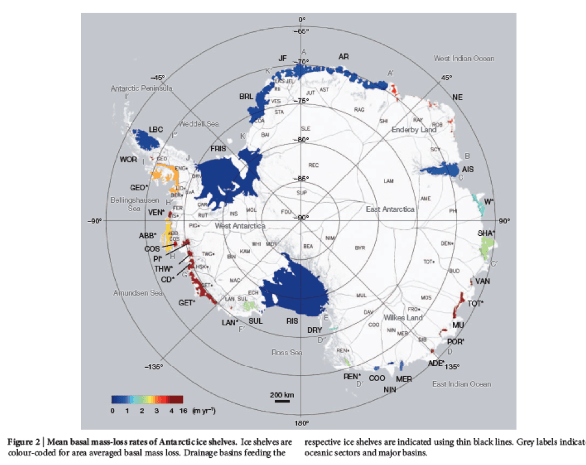 However on October 29, 2015 a team of NASA researchers led by Jay Zwally published the paper “Mass gains of the Antarctic ice sheet exceed losses”. If the new NASA research proves correct – and there is good evidence to suggest it is – continental ice is increasing and lowering sea level. That would highlight another major failure for both CO2 driven models and models of sea level change. The reaction of Dr. Theodore Scambos, senior research scientist at the National Snow & Ice Data Center, was all too reminiscent of the “hide the decline” mentality evidenced by advocacy scientists in the climategate scandal. In an Al Jazeera interview Scambos asked, “Please don’t publicize this study.” Others pushed back by simply listing any research that disagreed with Zwally, but rarely did they list the research supporting Zwally’s results. Nor did they delve into why there is no Antarctica consensus, as I will do here. On the other side of the issue RealClimate’s Gavin Schmidt downplayed Zwally’s results as we would expect telling interviewers, “I would pin more weight to the GRACE data than to this latest paper.” But it is not a matter of putting more weight on satellite data that measures gravity change (GRACE) or satellite data that measures changes in elevation (Zwally et al). Both methods are victimized by faulty Glacial Isostatic Adjustment models (GIA). All measurements of increased ice elevation or gravity changes are adjusted according to the assumptions of their GIA model of choice. Most GIA models assume Antarctica has been rebounding upwards since deglaciation removed the weight of glacial ice. The degree of estimated rebound depends on the region and more importantly 1) uncertain estimates of the mantle’s viscosity below the bedrock and 2) assumptions about the glacial history of Antarctica. It is not clear if Schmidt’s advocacy for the GRACE estimates was guided by his persistent protection of the global warming meme, or if his interviewers omitted any honest discussion of papers demonstrating the upward bias in most GIA estimates. Similarly other Zwally detractors pointed to papers such as Harig 2015 that claimed Antarctica was losing ice, but Harig 2015 used GIA models that were well known to over[-]estimate glacial rebound. To remove bias in GIA models, our best method requires comparing Global Positioning System data (GPS) that measures the current bedrock uplift with GIA modeled predictions. This requires placing GPS instruments on solid bedrock, which is relatively rare throughout most of ice covered Antarctica. However along the coast wherever GPS measurements have been possible,research revealed GIA models had biased the uplift upwards by 4.9 to 5.0 mm/years relative to GPS observations. Zwally argues that current GIA models should be lowered by just 1.6 mm/ year and that small adjustment would bring the estimates based on GRACE data into agreement with Zwally’s elevation data. There is more evidence to support Zwallys critique of GIA models. In recent years researchers have been lowering their estimates of mass gained during the last Ice Age and lost ice mass during the recent deglaciation. Previous models estimated Antarctica deglaciation contributed 24-37 meters of sea level rise, but that contribution has now been reduced to just 6-14 meters. This meant early GIA models had grossly overestimated the weight of past glaciers and the subsequent rebound. By adjusting the de[-]glaciation history,Whitehouse 2012 revised their GIA model so that the upward bias was reduced to 1.2 mm/year with error estimates of 2.3 mm/year. Less ice also meant previous models that budgeted sources of sea level rise were wrong. Zwally’s estimate that Antarctica has been gaining ice and thus reducing sea level has created more angst that current models of sea level rise are still in need of further adjustments. Furthermore, Zwally referenced evidence from Siegert 2003 showing parts of east Antarctica had been gaining mass for the past 10,000 years (Figure 2 below). 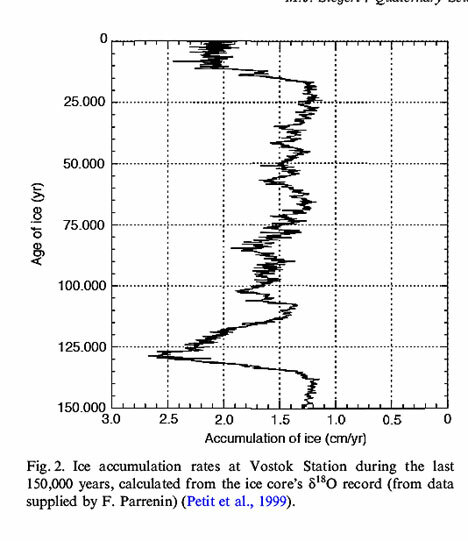 Counter[-]intuitively during the last Glacial Maximum ice accumulation dropped to a minimum. In contrast during warmer interglacials greater incursions of moisture entered the interior of Antarctica and ice accumulation peaked. Because east Antarctic is so cold (South Pole’s average summer temperature is -28C), ice ablation is minimal, so it is more likely east Antarctica is still subsiding under that weight, not uplifting. Zwally’s inference that GIA models should decrease their estimates of bedrock uplift by just 1.6 mm/year again is well supported. Zwally questioned if snow accumulation could continue to offset the ice lost from glacier thinning elsewhere. But recent evidence suggests it will. Zwally’s study did not extended past 2008 but he estimated that during the period studied, net accumulation had reduced sea level rise 0.23 mm/year ( a 6 to 10% reduction). More recent GRACE evidence has suggested even larger accumulation events since then. A 2012 study determined east Antarctica gained 350 Gigatons of snow between 2009 and 2011, enough to decrease sea level rise by 0.32 mm/year. A 2015 study using regional ice core data reveals no unusual temperature changes but an exceptional 30% increase in snow accumulation during the twentieth century, supporting Zwally’s analysis of mass gain in interior west Antarctica. Similarly Greenland’s snowfall accumulation is at all time highs and recentGRACE results show that after several years of accelerated ice loss due to glacier thinning, the net loss from Greenland in 2013-2014 was insignificant. As discussed here, relative to the years of greater ice loss in Greenland, the rate of sea level rise should have dropped by an additional 1.3 mm/year in 2014. Combining Zwally’s calculations with recent evidence from Greenland, sea level models driven by global warming should reveal a decreasing rate of sea level rise. It appears that global warming fears have been misdirecting research concerned with coastal flooding. Research shows groundwater extraction is not only contributing significantly to recent sea level rise, but land is sinking at a faster rate due to that extraction. Regretfully President Obama has highlighted coastal flooding to further politicize climate change, but never mentions the more critical issue of ground water extraction that desperately needs attention. Zwally’s analysis also noted that previous estimates of Antarctica’s ice mass assumed that increases in elevation were due to snowfall. But when ice accumulation is greater than ice discharge, drainage basins undergo dynamic thickening, and dynamic thickening can occur in response to accumulation events that happened thousands of years ago. Because the density of ice is about 3 times the density of snow, if researchers incorrectly assume increased elevations are only due to snowfall and not dynamic thickening, estimates of ice mass will be greatly underestimated. This points out the need to see climate change within a framework of thousands of years, not just the past few decades, and Zwally’s interpretation of dynamic thickening can be readily tested by additional ice cores. In the face of Zwally’s analysis, defenders of the CO2 warming meme retreated to stressing uncontested observations of lost ice due to dynamic glacier thinning or uncritically accepting speculative models catastrophic deglaciation. Although Zwally calculated the net “mass gains from snow accumulation exceeded losses from ice discharge by about 112 and 82 Gt/year respectively during the 1992-2001 and 2003-08 measurement periods”, he also reported that the rate of ice loss along the west Antarctic coast and the peninsula had increased from 64 GT/year to 135 GT/year during those same periods. Alarmists seize upon this short[-]term acceleration to suggest rising CO2 will cause the rate of dynamic thinning to increase. But research shows dynamic thinning has been more cyclical, intermittent and episodic with no correlation with CO2 concentrations. For example a large 1987 calving event removed 100 years of ice accumulation from the Ross Ice Shelf in just one day, an amount second only to the loss of the Larsen Ice Shelf. Such episodic events can easily be misinterpreted as an “acceleration” of ice loss. However due to the heavier snow accumulation since that time, the ice shelf has expanded further northward exceeding it previous extent in just over a decade (Keys 1998). Antarctica undergoes rapid ice loss followed by periods of slower recuperation depending on regional rates of snow accumulation. So a much broader timescale of climate change must be embraced. Research has determined these episodic calving events are most often driven by periodic upwelling of warm Circumpolar Deep Water (CDW) that melts glaciers from below (basal melting). The extremely cold Antarctic climate maintains a 200 to 300 meter surface layer of near freezing Winter Water that insulates warmer CDW below. All grounding points below 300 meters have been susceptible to basal melting from upwelled CDW for millennia, and a pattern has emerged that glaciers with deeper grounding points incur greater basal melting. Thus the topography of the coastal shelves and depth of submerged glacier grounding points determines the impact of upwelled CDW and limits extreme basal melting to a relatively few locations as illustrated by the red and orange areas in the figure below (from Depoorter 2013)..
Reports of increased basal melting due to “warmer” water is often misinterpreted to mean CDW water had been warmed by rising CO2. But CDW is a tremendous reservoir of heat that only experiences temperature changes on long[-]term scales of centuries and millennia. Upwelled CDW water can be cooled when modified by winter water, or remain warm when it directly accesses a glacier grounding point. Reading recent research carefully reveals no change in the temperature CDW source waters. It is periodic increases in the volume and velocity of intruding CDW that accelerates basal melt. 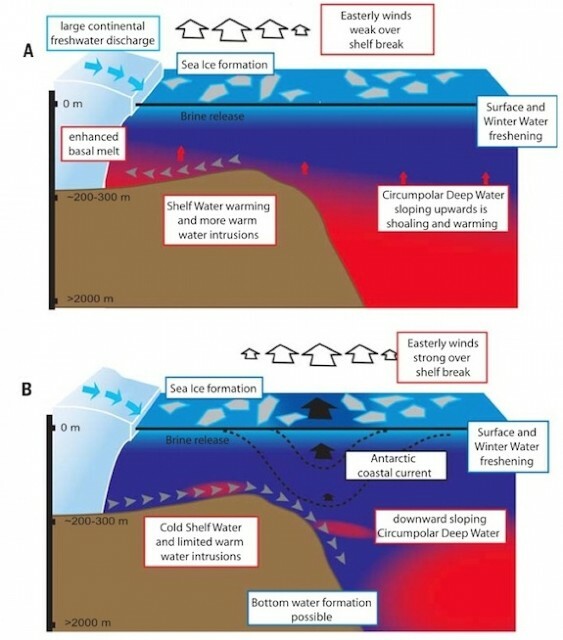 Coastal shelves that allow the greatest intrusions of relatively warm CDW experience that greatest basal melt such as Pine Island and Thwaites glaciers, which account for the overwhelming majority of Antarctica’s dynamic thinning. Antarctica’s glacial thinning is a very localized phenomenon, and not evidence of global warming. In addition to conducive topography, intrusions of warm CDW are driven by periodic changes in the winds which in turn are controlled primarily by the Amundsen Sea Low (ASL), a quasi-permanent low pressure system. The ASL shifts poleward and equatorward, as well as eastward and westward with the seasons. It also shifts in response to inter[-]annual and decadal changes in sea surface temperatures in the tropical Pacific. The shifting center of the ASL causes varying wind intensities that also alternate direction between easterlies and westerlies. As illustrated below the direction of the wind over the shelf break determines the amount of CDW that reaches the glaciers grounding points along the peninsula and Amundsen Sea. Paleo[-]climateresearch suggests the position of the ASL also shifts between glacials and interglacials, and drove warm CDW shoreward during interglacials and accelerated glacier retreat. Other researchers have demonstrated warming in Antarctica that followed the last glacial maximum preceded any increase in atmospheric CO2. Both warming and CO2 appear to be driven by changes in the position and strength of the westerly winds and the upwelling of warm CDW. During the past 10,000 years research at Marguerite Bay on the peninsula reveals extensive glacial melt, limited sea ice which enhanced primary productivity that lasted for over 2000 years and was consistent with evidence of increased upwelling of warm CDW. The George VI Ice Shelf collapsed about 9000 years ago but reformed 7000 years ago and that shelf still persists today. Over the last 5000 years intermittent melting and reforming of sea ice in the Marguerite Bay is consistent with enhanced sensitivity to ENSO forcing and increased upwelling of CDW; a similar sensitivity to ENSO events has been documented over the most recent decades. History strongly suggests periods of accelerated glacial thinning are natural and quite common. It will be of great interest to see how the IPCC spins this state of affairs.